We place dancers in classes primarily by experience, while also taking age into consideration. We are happy to help you determine which class would be best suited for you or your child. In many cases, we will have students try a class before we place them, so please do not purchase the class uniform until we have finalized that the class placement is a good fit. See progression at right. This class is a combination of Jazz dance and acrobatic movements including tumbling and flips. This class is taught on and off mats. Our philosophy is that Dance is for everyone. We encourage everyone, regardless of age, ability, or body type, to try dance. We have adult classes in numerous disciplines and for different levels. Our non-competitive, supportive environment makes people feel right at home. We also have an adult performing dance company, Ballet Misha that provides an opportunity for serious dancers to perform. Whether you danced as a kid and want to get back into it, or always wanted to dance and never did, you have found the right studio. Ballet emphasizes building the alignment, strength, and flexibility necessary for classical ballet and contemporary dance work. The full range of ballet vocabulary will be covered. Students will develop a sense of musicality and phrasing, and an awareness of ballet as a vital foundation for all forms of dance. We encourage all dancers to take ballet as it is a fundamental building block for all other forms of dance. Contemporary dance is the latest name for a dance style that encompasses movement from a wide range of disciplines including Ballet, Lyrical, Jazz, and Modern. Contemporary has the greatest range of movement of any discipline as it borrows from many styles. Jazz is a fun and upbeat form of dance that incorporates moves from theatrical and commercial dance and is often performed to contemporary music. This popular style of dance uses appropriate hip hop and pop music while learning energized dance combinations and the latest moves. Our Hip Hop has a strong Jazz base. Lyrical is an expressive style of dance where not just dance moves, but also emotive content is taught. Like Contemporary, Lyrical can embrace many styles of dance. Modern is a dance technique that builds off ballet fundamentals and teaches many different dance dynamics including using weight, imbalance, sustainability, and improvisation. Modern utilizes all dance planes including the floor and air. Dimensions in Dance is fortunate to have many male dancers and athletes willing to do partnering workshops with our strong ballet dancers. We have partnering workshops at regular intervals throughout the year that focus on teaching lifts, turns, and promenades safely. For the more advanced ballet student, pointe is offered to students at the discretion of their ballet instructor. 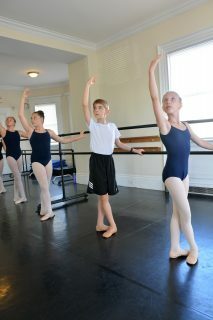 Students enrolled in this class must also attend at least two other ballet technique classes during the week. Our little ones will learn body awareness and improve motor skills by skipping, jumping, galloping & leaping to music. Our teachers use lots of imagination, creativity, props, and games to engage children, while also teaching dance fundamentals. 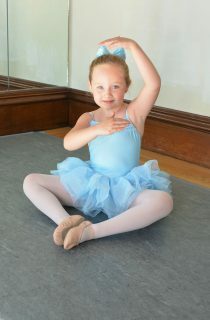 Our pre-ballet introduces basic ballet positions and movement to help build strength and balance. Children also learn patience, to wait their turn, to follow directions, to remember vocabulary, and how to count and listen to music. We begin taking students in this class at 2 ½ years old. Tap can be one of the most exciting dance styles. Its return to Broadway reminds us of how entertaining it is. Students will develop rhythm, balance, coordination, and make lots of noise! This class teaches dance routines inspired by Broadway shows and helps dancers work on dance fundamentals to improve their dance overall. This class is wonderful for those studying theatre or musical theatre as an extra class to work on just dance. Our little ones will learn body awareness and improve motor skills by skipping, jumping, galloping & leaping to music. Our teachers use lots of imagination, creativity, props, and games to engage children, while also teaching dance fundamentals. This is a wonderful opportunity to introduce children to an activity away from their parent, while their parent or caregiver is seen close by though the glass doors. Children also learn patience, to wait their turn, and to follow directions. This class offers valuable cross-training to our dancers and helps prevent injuries by keeping bodies lithe and muscularly balanced. This class has a warm up, strengthening exercise, and stretches, and frequently uses thera-bands, balls, and weights. This class teaches breath control, focus and meditation, and a series of yoga body postures designed to increase fitness, relaxation, and overall health.